VMU Results 2019 vmrf.edu.in Result 2019 Vinayaka Mission’s Research Foundation Result 2019. Vinayaka Mission University (VMU) known as its excellent, satisfaction of the highest level of academic standards and best infrastructural facilities provided to achieve preeminence in education. The university offers various courses for UG, PG, M.B.B.S, MD / MS / PG Diploma and Certificate courses. VMU is now Vinayaka Mission’s Research Foundation (VMRF). Vinayaka Mission’s Research Foundation is accredited by National Assessment and Accreditation Council (NAAC). Students should note that Vinayaka Mission University (VMU) is now known as Vinayaka Mission’s Research Foundation (VMRF). The web portal also changes vmrf.edu.in to www.vinayakamission.com. VMRF provides both regular and distance courses, conducted their exam and published their exam results in their official web portal. In this page, we have put the exact link to check VMU/VMRF Results online. The Programs offered by VMU/VMRF is under DDE duly recognized by joint committee (UGC, AICTE, DEC). To check the VMRF Results 2019 regular students may visit the official website to download VMU exam result 2019. Unlike the VMRF DDE Results in this case students have to download an excel file to check the score in different subjects. In the main menu under “Examination” click on “Result”. A result list page will open. Now select your exam name and download the excel file. 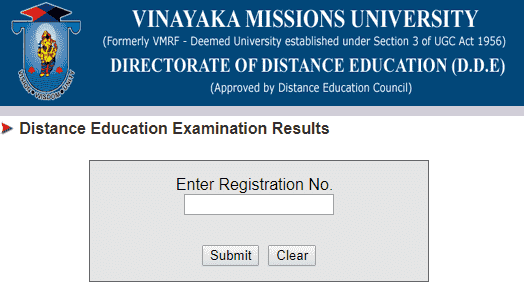 To check the VMU Distance Results 2019, the DDE students may visit the official website to download VMU exam result 2019. Under Distance Education click results vmu de. Now Distance Education Examination Results page will open. Enter Your Registration No. and Click Submit Button.